Joyce Glasser reviews The White Crow (March 22, 2019), Cert. 12A, 127 min. It has to be a coincidence that this week two biopics of two of the greatest male ballet dancers in recent memory are being released, and that much more than ballet, charisma and athletic bodies unite the two men. In Yuli – The Carlos Acosta Story we see that Carlos Acosta, like Rudolf Nureyev, was the youngest born to an impoverished family in a Communist country where black people (his father was African, his mother white/Spanish) were as ostracised as were Russia’s Tatar Muslim minority. 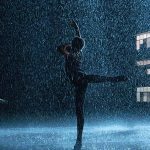 Both dancers were given opportunities to train with the best teachers in their countries because of their outstanding, raw talent, despite being ‘difficult’ wilful children. Both escaped the limitations of their respective Communist homelands to make their names in Europe and the USA but never lost the love of country. Both raised a lot of money for ballet charities in their respective countries but became directors of major European ballet companies (not in the film, Acosta has recently become director of the Birmingham Ballet). Neither film devotes much time to the dancers’ romantic life, but they both enjoyed/are enjoying long term relationships. 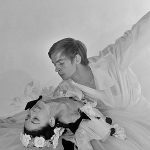 Nureyev’s 25 year partnership with Danish dancer Erik Bruhn (that ended when Bruhn died, presumably of AIDs) whom he met in 1961, the year he defected, is touched upon briefly. Acosta’s marriage to British model and author Charlotte Holland with whom he has three children, is omitted altogether. The biggest difference in their lives is that Nureyev always wanted to escape to the West, and was then prevented from returning to see his beloved three older sisters and mother. Acosta, who was dragged screaming into ballet by his father, followed the work, leaving a bit of his heart in Havana with his autocratic father, mother and two beloved older sisters (and he ten siblings), but visited them regularly. Following the Morris siblings’ disappointing cradle-to-grave documentary entitled, Nureyev actor/director Ralph Fiennes (Coriolanus, The Invisible Woman) tackles a cradle-to-escape-to-freedom biopic of the iconic Tatar ballet dancer, based on a screenplay by David Hare (The Hours, The Reader). Cradle-to-grave biopics being unwieldy if not old fashioned, filmmakers nowadays look for a focus and a story within the subject’s life story. If Yuli – The Carlos Acosta Story focuses on Acosta’s childhood and his relationship with his father, The White Crow focuses on Nureyev’s trajectory to freedom in the West, which is presumably why it stops in 1961 leaving, perhaps sensibly, the last, arguably richest 32 years of his life untouched. The problem is that the film fails to explore, let alone to dramatise, this huge and risky decision, the greatest of his life. Fiennes, who speaks Russian and plays Nureyev’s ballet master in the film, has found a credible surrogate in Russian soloist Oleg Ivenko. 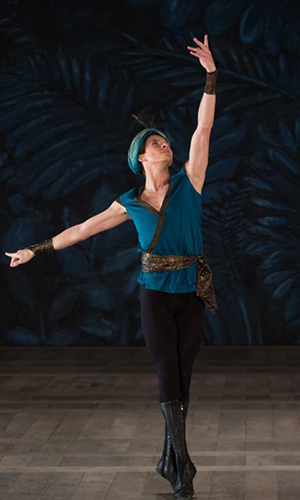 Ivenko, who dances beautifully and has a reasonably exotic face like Nureyev, is a real find. One of the challenges in a celebrity biopic (and presumably why actor Rami Malek won an Academy Award and BAFTA for his impersonation of singer/musician Freddie Mercury in Bohemian Rhapsody) is finding a credible substitute for a celebrity who many viewers will have seen live on stage. 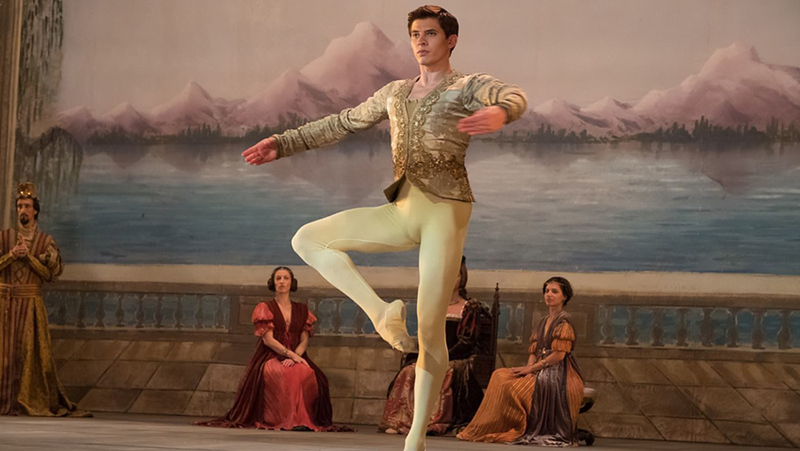 The only time doubts arise with the casting of Oleg Ivenko is when one glimpses the famous Ukrainian (and former Royal Ballet principal dancer) Sergei Polunin as Nureyev’s fellow dancer Yuri Soloviev. Anyone who saw Steve Cantor’s riveting documentary, Dancer, might wish that Fiennes had cast this other bad boy of ballet in the central role and let him fly. But perhaps Polunin is too well known and would have cannibalised the role. The main problem lies not in the casting, but with Hare’s clunky and directionless script that robs the film of any dramatic tension. Moreover, Hare never gets inside Nureyev’s mind or captures his flamboyant passion. When Fiennes focuses on key dramatic set pieces, the film reveals its potential. Shot like archival footage against a Siberian landscape, we witness the birth of little Rudolf in a chaotic, crowded train on March 17, 1938. We jump to May 1961 and Le Bourget Airport where a reporter asks Nureyev, ‘This is the first time since the war the Mariinsky (Kirov) Ballet has been in the West. Do you think it will have an effect on Cold War relations?’ This is also the first, but sadly, not the last, expository line that plagues the script. Symbolically passing by La Place de la République, the arrogant Kirov soloist is looking for a shop selling – yes, you guessed it, toy trains. At the Palais Garnier Nureyev notices his name is not on the list of those dancing: punishment for fraternising with capitalist foreigners. To a sympathetic fellow dancer, he says, ‘What difference does it make? Soon everyone will know who I am.’ Twenty-two years later, Nureyev would be Artistic Director of the Royal Ballet in the Palais Garnier. A ‘six years earlier’ caption takes us to Nureyev’s formation in 1950’s Leningrad where his ballet master at the Vaganova Academy of Russian Ballet, Alexander Pushkin (Ralph Fiennes), has spotted his talent, and is trying to help the 17-year-old make up for his late start. Pushkin’s wife also takes a personal interest in the handsome lad with the gorgeous body. But no sooner does the film become alive with this ménage à trois, then we are winched out of it. And then the film collapses into a disjointed series of scenes designed to inform us of Nureyev’s wilfulness and non-conformity, which earned him the nickname White Crow (an outsider); to show us his arduous ballet practice; briefly, his bi-sexual love life –; and to remind us again of his childhood poverty and his raw talent. Back again in Paris, 1961, Nureyev meets and hangs out with the Clara Saint (Adèle Exarchopoulos), the pretty 19-year-old Chilean ex-pat mourning the sudden death of her fiancé, the son of the famous author and Culture Minister Andre Malraux. 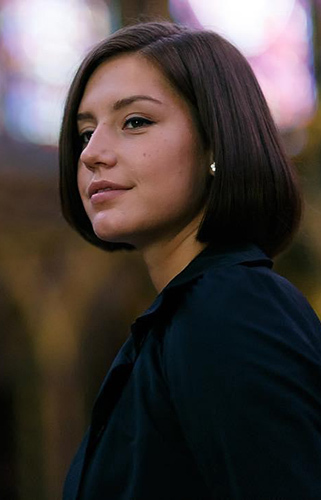 While the scenes with Clara are tedious, her purpose in the film is revealed in the extended defection scene which is worth the price of admission. More accurate than the defection stories in several other biopics, and brilliantly dramatised, at last the film comes alive. This long sequence provides the drama, tension, atmosphere and excitement lacking from the film as a whole.